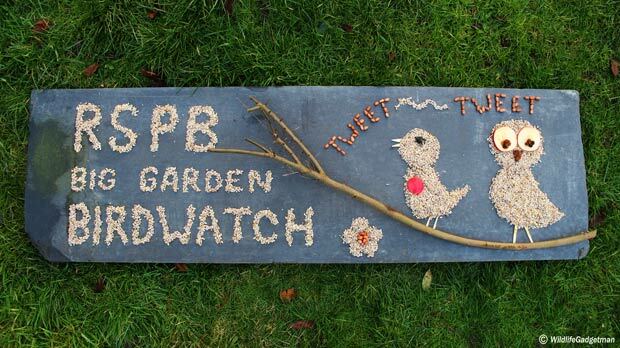 It’s expected that more than half a million people from across the UK are set to take part in counting the birds visiting their gardens over the weekend of 30-31 January 2016. Will you be one of them? Why should you care? With hundreds of thousands of people taking part each year we get an invaluable snapshot of how the birds are doing across the UK. The scale of this survey, which is widely considered the largest of it’s kind in the world, helps us with reasonable accuracy to spot potentially worrying trends and hopefully gives us time to discover ways to put them right before it’s too late. A classic example of this is the House Sparrow and Starling. Personally, around this area of Suffolk I see good numbers of both species but across the UK numbers have dropped alarmingly. Since its start in 1979 the survey has shown a staggering 58% drop in house sparrow numbers and an massive 80% reduction in Starlings. The reason? Lack of food? A reduction in safe places to nest? Probably both and this is just one of many reasons why taking part in the survey and giving nature a home in your garden is so important. Well, its wonderfully simple. On the weekend of January 30-31, choose when you want to start, make yourself comfy and watch the birds for an hour. You could watch them from your window, or sitting in the garden. Maybe you could put a tent in the garden and watch from inside or maybe even convert your shed into a bird hide for the weekend?! 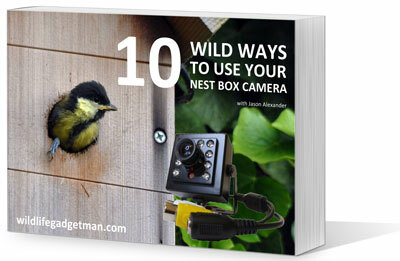 Record the highest number of each bird species you see at any one time. When the hour has finished record your results on the survey form online. Alternatively you could use the live bird counter at rspb.org.uk/birdwatch. You can access this on your laptop, tablet or phone. 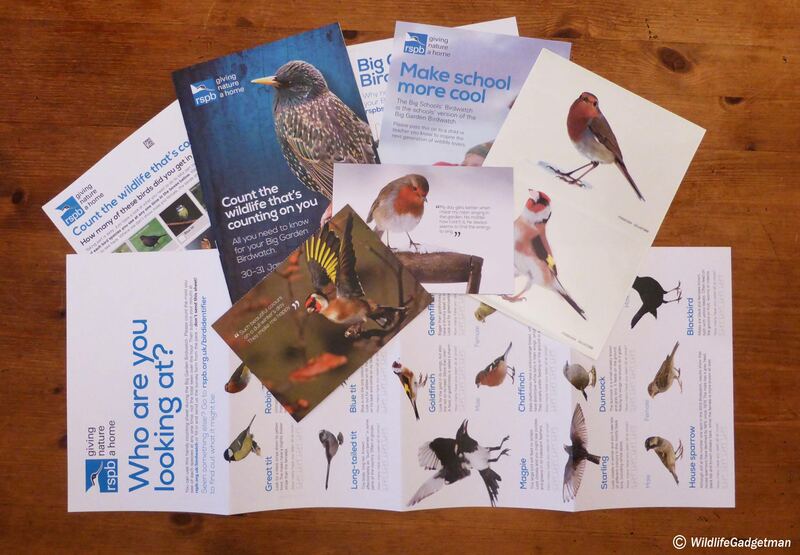 You could also request a Big Garden Birdwatch Information Pack full of useful information, an ID chart, widow stickers and more. 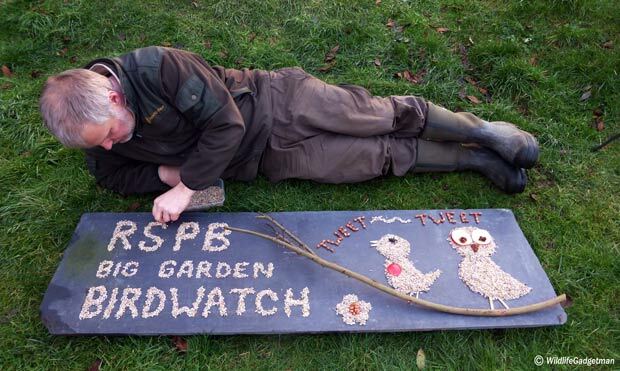 I like to have a bit of fun when I take part in the survey and one of my favourite ways is to get a little arty with my bird food! One of my most ambitious creations was last year. 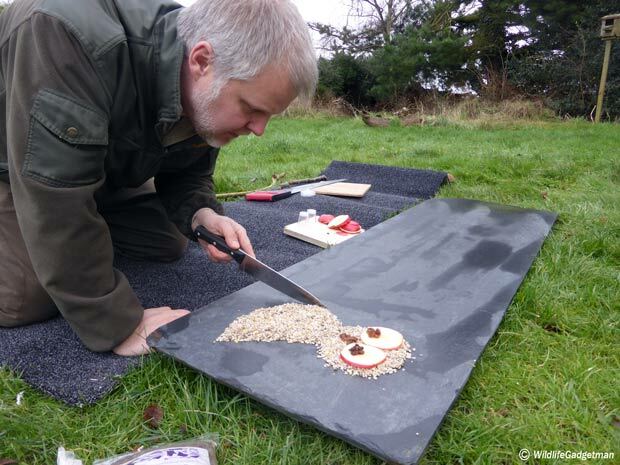 I used a large piece of slate to provide a blank canvas for my bird seed masterpiece but you could easily use a piece of timber sheet or just the surface of your bird table. The ground was pretty damp so I was so pleased to find an old piece of carpet in the shed to protect and cushion my knees. I used a selection of bird seed. Black sunflower seeds and sunflower hearts are great as they offer a good contrast. I also used peanuts, raisins and an old sliced apple. I also used a large twig in my final design. Feel free to use additional props from around your garden to add an extra dimension to your final design. Be careful to use only items that are not harmful to the birds or other wildlife though. And here is the final design! Pretty good eh?! Well I was pleased with it! 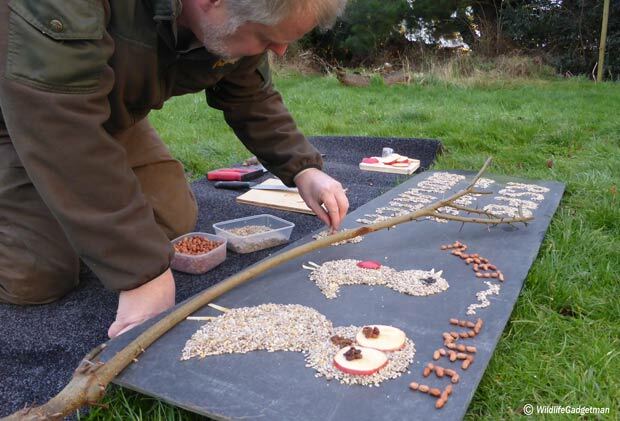 If you are feeling extra creative why not have a go at creating a time-lapse of you making your piece of bird seed art? You could also make a time-lapse of the birds destroying your masterpiece as they get stuck in. Reverse the video when editing like I’ve done below and it will look like the birds are creating the art themselves!